Be the first to share your favorite memory, photo or story of Debora. This memorial page is dedicated for family, friends and future generations to celebrate the life of their loved one. 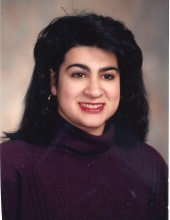 GAITA, Debora R. of Norwood passed away on January 14, 2019 at the age of 45. Cherished and loving daughter of Guido and Rosetta (Alvino) Gaita of Norwood. Dear sister of Anthony Gaita of Norwood, Carlo Gaita (USMC, ret) of Walpole. Loving and devoted aunt to Anthony Gaita of South Boston and Sabrina Gaita of Walpole. Deb was an Executive Producer at WFXT-TV in Boston. Deb was a graduate of St. Clare’s High School in Roslindale where she distinguished herself as Valedictorian. A graduate of American University with degrees in Journalism and Spanish, Deb was also a proud member of The Phi Mu Sorority. Deb launched her career at WMAZ in Georgia where she was a Producer, and then moved on to become Producer at WFMY News 2 in North Carolina before returning to the Boston area as Producer at WHDH 7 news. She then accepted a promotion as Executive Producer at WPXI in Pittsburgh, where she lead the nighttime news team, and later managed the Special Projects unit. Her career gave her the opportunity to come home, with a position as an Executive Producer at WFXT. In that role, she lead the Investigative Unit, and helped lead coverage of many big breaking stories. In Pittsburgh, Deb won her first of four Emmy awards for her distinguished work in crafting newscasts and for the station’s stellar sports coverage. In Boston, she won two more statues, for her work on an investigative report, as well as another on the opioid crisis in Massachusetts. Deb cherished her family from her parents to siblings, her godchildren, Sabrina and Christopher Kelly, to her many cousins, aunts, uncles and extended family and colleagues. Deb lived her life with great zest and this passion was channeled in all facets of her life. She visited Italy, Ireland, Costa Rica, Nova Scotia, Spain and travelled extensively throughout the US to visit several MLB Stadiums and her favorite beaches in the Southern Outer Banks. Her passions and hobbies extended from sports to charitable events. The Patriots, Red Sox, Bruins, Celtics, Deb was passionate about her home teams and watched every game, analyzed their plays, knew their adversaries and was at every victory parade in Boston to celebrate their wins. Deb was also a lover of music. She had varied tastes, from Michael Jackson to Andrea Bocelli. In 2017, she fulfilled a lifelong dream of seeing U2 in Dublin, Ireland. Walking in the Jimmy Fund Walk, the Susan G. Comen Breast Cancer Walk, Relay for Life for the American Cancer Society, Deb embraced every opportunity to drive awareness, raise funds, gain support and encourage those affected by cancer. Strong, passionate, compassionate and driven, Deb approached every aspect of her life with the same vigor. From her friendships which dated back to her elementary school days at the Balch School in Norwood, her career in TV news, and the various friends she made in her travels, she was an overachiever, setting the bar for living. She embraced all that life had to offer. Her smile made her eyes dance and her laughter was infectious. Undaunted by her diagnosis, she approached treatment as she did everything else in her life – full throttle with passion and strength. More concerned with supporting those around her, she had the courage of a lion in facing every challenge and setback. Funeral from Kraw -Kornack Funeral Home 1248 Washington Street, Norwood, Saturday, January 19, 2019, at 8AM followed by a funeral mass at 9 AM at St. Catherine of Siena Church on Washington Street in Norwood. Visiting hours will be held on Friday, January 18, 2019 from 4-8PM. Burial will be held at Highland Cemetery in Norwood. In lieu of flowers, donations may be made in Deb’s name to The Susan G. Komen Foundation. To plant a tree in memory of Debora R. Gaita, please visit our Tribute Store. "Email Address" would like to share the life celebration of Debora R. Gaita. Click on the "link" to go to share a favorite memory or leave a condolence message for the family.